Royal Caribbean has today made history, the world’s largest cruise ship is delivered to the cruise line and a historic ceremony was held. Harmony of the Seas was delivered to the cruise line at the STX France shipyard in Saint Nazaire, France. During the traditional ceremony at the ships AquaTheater a flag was exchanged and all the crew and workers were honoured. 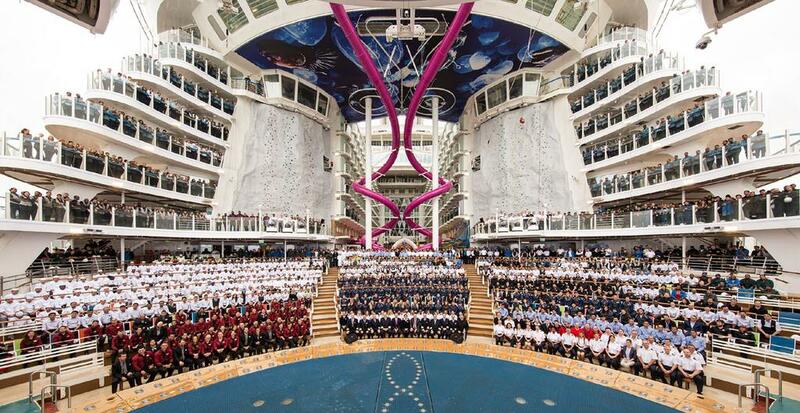 The ceremony was attended by key personnel from STX France and Royal Caribbean International. Harmony of the Seas has been under construction for 32 months where several major milestones were reached including the first float out on water and the keel laying. The large 227,000 gross ton vessel is now home to 2,100 crew members as most of the contractors and workers have completed their work. The crew is doing last-minute setups ready for the ship’s first cruises out of Southampton, UK in just over a week. Royal Caribbean has released some stats of the world’s largest cruise ship, the ship will have 10,587 plants, 48 vine plants and 52 trees, 11,252 works of art showcased throughout the ship and 4,700,000 lbs. (2,150 tons) of water spread across many water features around the ship. Harmony of the Seas is introducing some groundbreaking features including the 100-foot long and 10-story high Ultimate Abyss Slide. The slide which is located at the aft twists and turns from deck 16 to the Boardwalk on deck 6. The ship will also feature Robotic Bartenders, first class broadway shows, dozens of dining venues including Jamie Oliver’s Italian restaurant and the fastest internet at sea called VOOM. Harmony of the Seas will home port in Barcelona, Spain and embark on the first of 34 seven-night sailings in the western Mediterranean on June 7. In November 2016, Harmony will arrive at her home port of Port Everglades, Fort Lauderdale, FL., from where she will offer seven-night eastern and western Caribbean sailings. The world’s largest cruise ship which cost over $1 Billion to build spans 16 decks and can carry 5,479 guests at double occupancy in 2,747 staterooms.